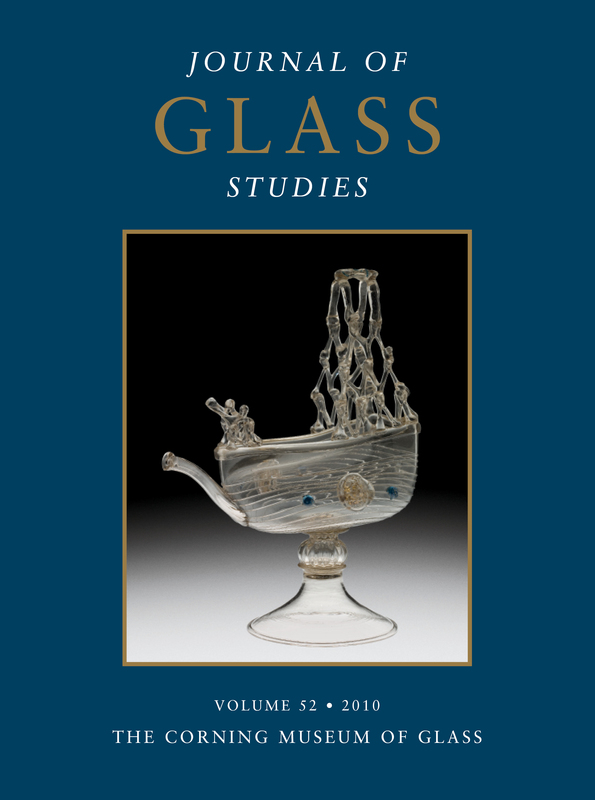 In this volume, Olive Jones studies black glass bottles from England during the 18th and early 19th centuries; Florian Knothe looks at cross cultural influence in glassmaking during the 18th and 19th centuries; and David Whitehouse remembers the late Thomas S. Buechner (1926-2010), who was the first director of The Corning Museum of Glass and founder of the Journal of Glass Studies. Several wall and vault mosaics were made in Christian churches in Rome between the fourth and 12th centuries. These mosaics are made almost exclusively of glass tesserae in the form of metal leaf (gold and silver) or glassy opaque colored material. Large quantities of opaque flesh-tone (pinkish) glass tesserae were used for flesh-tone details in these mosaics, while marble tesserae were employed in later mosaics. In order to improve our understanding of the coloring technology of the flesh-tone glass, analyses were performed to compare the chemical composition of the flesh-tone tesserae from Roman wall mosaics with that of transparent colorless and opaque white tesserae of the same location and period. PIXE analyses revealed that gold is present in all of the flesh-tone tesserae, but not in the transparent and opaque white ones. The average gold concentration (10–35 parts per million) is comparable to that of flesh-tone tesserae in modern glass mosaics. The color of these tesserae cannot be explained by any other detected element. The identification of gold as the coloring agent challenges the belief that Roman glassmakers could not have known and controlled the complex technique of gold ruby glass production. After all that has been written about the ruby glass of Kunckel, we now wish to examine what Muranese glassmakers knew about gold ruby. Giovanni Darduin took from the papers of his father, Nicolò, who died in 1599, a recipe for ruby glass made with gold, but no objects or even fragments of Venetian gold ruby made in the late 1500s and early 1600s have survived. We know a number of late 17th- to early 18th-century recipes that Muranese glassmakers may have brought back from their sojourns in France. Blown Muranese ruby glasses made at the beginning of the 18th century are preserved at Rosenborg Castle, and archival documents record its production in the first four decades of that century. However, Muranese gold ruby was principally used in the 18th century to decorate colorless objects, to make beads, and to produce tiles for mosaics in St. Peter’s Basilica, Rome. Letters written by Philipp Hainhofer (1578–1647), a citizen of Augsburg and an agent who was very active in obtaining news and art objects for several European (mainly German) princes, provide a mine of information on many aspects of life and culture—including glass—in the first half of the 17th century. In a letter of 1610, Hainhofer supplies some additional facts on bright green vessels made of high-lead glass such as were introduced in an earlier article (Ingeborg Krueger, “Post-Medieval Colored Lead Glass Vessels,” Journal of Glass Studies, v. 48, 2006, pp. 225–241). According to Hainhofer, such vessels were made at Pisa, they were as beautiful as emerald and heavy like lead, and they were something extraordinary in Germany. In April 1614 (and later), Hainhofer wrote about a Venetian nobleman and “alchemist” named Luca Trono (Tron), who had contacts with many princes in Germany, England, and France, and who sold them pieces of jewelry with natural or (mostly) artificial gemstones. Trono’s stock included ear-pendants, rosaries, necklaces, and one little bowl consisting of a new artificial stone with golden stars inside. This can only have been aventurine. Trono pretended to have melted this glass himself, purely by chance. At that time, aventurine was probably a very recent “invention,” and Hainhofer’s letters provide what is so far the earliest written evidence for its existence. The name Antonio Neri is quite familiar to glass artists, collectors, and researchers. While the discovery of historical materials pertaining to the priest has continued, the perception persists that little or nothing of his life is known. This article presents an annotated bibliography of primary references concerning Neri, including manuscripts, letters, and other documents generated during his lifetime. These are references written by him, addressed to him, or naming him. To the best of our knowledge, a comprehensive list of these materials has never been published anywhere. Together, these references form the nexus of our knowledge about Neri, a good portion of which is still unexplored by scholars. Because of recent advances in computer technology, many of the documents listed here are available through the Internet as scanned image files. This article discusses technological changes in casting glass panes in Baroque-period France. Glass casting had been known and practiced since antiquity, but it was improved during the reign of King Louis XIV. In Orléans, the Altarist glassmaker Bernard Perrot successfully cast glass outside the furnace by using sand molds, a controlled process that he borrowed from the casting of metal stove tiles. Perrot wanted to make relatively small relief plaques, not large panes. The making of panes, which was required for the production of large mirrors, was achieved by Louis Lucas de Nehou about 1688 in Tour-la-Ville, Normandy. Nehou provided the appropriate equipment for handling large quantities of hot glass outside the furnace. Crucibles filled with molten glass were removed from the melting furnace to a casting table, where they were emptied onto a metal casting plate. The thick glass panes produced by this method retained sufficient heat and viscosity while they were transferred to the annealer, thus preventing premature cooling. From about 1725 to 1850, the English black glass bottle industry made bottles in various shapes and capacities in response to increasing demands from makers and vendors of wines, beers, medicines and chemicals, commercial foods, snuff, and natural and artificial mineral waters. To manage the records of production, warehousing, shipping, and sales, bottle manufacturers and merchants used a commonly understood vocabulary. Based on their records and on newspaper advertisements, this article presents a glossary of terms employed in the English black glass bottle industry. Included in the glossary are discussions of shapes and possible contents. In addition, with the use of bottles from archaeological, private, and museum collections, some bottle styles are matched with historical terms. Erik Laxman (1737–1796) invented a process of converting sodium sulfate into soda ash, and he used it to make glass. He recognized the great loss of woodlands caused by the burning of trees to produce potassium carbonate. In eastern Siberia, he found a salt lake whose shores were covered with sodium carbonate, and he soon started a glassworks of his own, using that soda ash. He employed local pegmatitic feldspar as a source of silica. The glass was in the soda-alumina-silica system, with a low liquidus temperature but rather high viscosity. Laxman was the first to use soda ash for the large-scale production of silicate glass. Samples of glass similar to that made by Laxman were recovered and analyzed. Some small-scale melts of the same compositions were made, and their viscosity–temperature relations were measured. These data are reported. This article discusses the making and collecting of 18th-century glass imitations of gems, which are very numerous. Unfortunately, scholars have encountered difficulties in attempting to distinguish and date ancient and modern casts of ancient gems. This confusion is reflected in the terminology that is used by modern scholars. Much work remains to be done with the help of many available resources: antiquarian, historical, and artistic, as well as X-ray fluorescence (XRF) and other nondestructive analytical techniques. Included in the article is a history of the manufacture of false gems with glass and of the production of glass that resembles precious or semiprecious stones. There is also a brief discussion of the ability of Venetian glassmakers to make glass imitations of precious stones, which demonstrates that they were also capable of creating glass casts of gems, but there is virtually no documentary evidence to provide a fuller account of this activity. Technological knowledge and decorative styles had an impact that is particularly noteworthy in western European and East Asian countries. In the West, the cultural influence of Chinese porcelain and the fashion for chinoiserie led the makers of porcelain and glass to develop new recipes and iconographic themes in imitation of those of the treasured imported wares from the Orient. The stylistic influences of Asia reached all of western Europe, leading to individual interpretations of the imported exotic imagery, but Western styles were not so readily adopted in the East during the 18th century. (They were successful, however, in mid-19th-century Japan.) By contrast, in East Asia, the adopted chemical knowledge of European glass manufacturers allowed local artists to develop new colors and overlay techniques, and to produce, among other works of art, carved pieces in glass that are related to traditionally fashioned hard-stone objects. This article explores the place of Ulisse De Matteis (Florence, 1827?–1910) in the revival of stained glass in 19th-century Italy. Beginning in the 1820s, when the Bertini family established a stained glass atelier in Milan, restoration projects all over central and northern Italy created a need for stained glass carried out in revival styles. Before De Matteis, however, no Italian stained glass artist created windows that the French artist and critic Adolphe Napoléon Didron (1806–1867) would have defined as vitrail archéologique, a stained glass window made in the manner of, and resulting from an archeological study of, medieval windows. Instead, Italian stained glass artists made windows from large panes of colorless glass painted with many colors of enamel pigments. De Matteis moved away from the approach of his compatriots to create stained glass windows that embody Didron’s principle of the vitrail archéologique. This archeological revival of medieval stained glass took place in Florence, the capital of Tuscany, where, in the 1850s and 1860s, the idea of the medioevo, then defined as the period between the 14th and early 16th centuries, was an important part of Italian nationalism and central to Florence’s sense of its political and artistic importance.